Balmy sunny days, sandy beaches, warm ocean waters, gentle tropical breezes, gorgeous sunsets ... THIS IS WHAT MAUI IS ALL ABOUT! Visit sunny Kihei and stay in a deluxe oceanfront two bedroom, two bathroom condo, with all the comforts of home. You can hear the sounds of the waves and enjoy spectacular views of the ocean, beach and sunset right from your private lanai or master bedroom. This remodeled second floor unit at the Royal Mauian Resort is just steps away from two of Maui’s best swimming beaches. It's perfect for families, couples, and friends. Simply pack your swimsuit and come. We’ll even provide your beach towel! 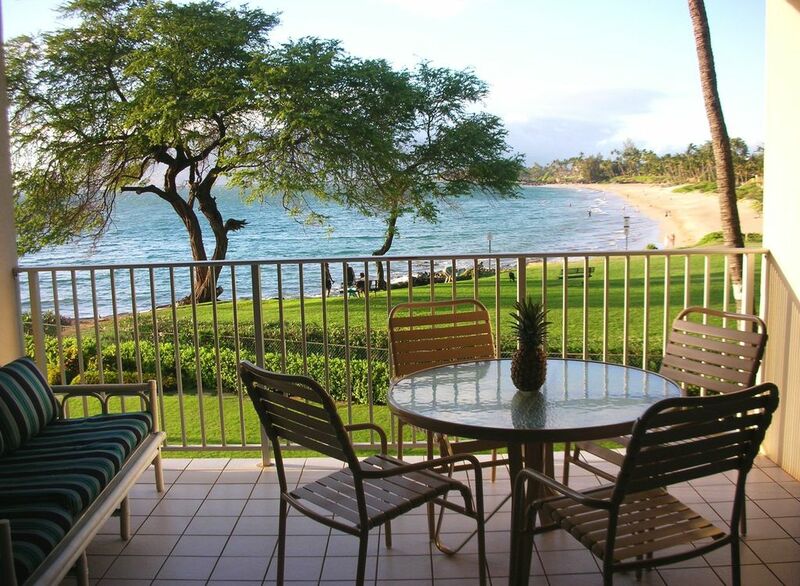 Our condo’s northwest orientation provides an awesome view of Kamaole Beach I to the north. To the west are views of the ocean, sunsets and the island of Lana’i. This location in the building avoids the heat caused by the afternoon sun, keeping the unit a comfortable temperature with just the use of ceiling fans. Located on Maui’s southern shore, the Royal Mauian Resort is a beachfront complex beautifully situated between Kamaole I and Kamaole II Beach Parks. You can snorkel among the rocks right in front of the building and discover colorful tropical fish and sea turtles, or relax in the heated ocean-side swimming pool. The rooftop garden offers barbecues and a sensational 360-degree view that includes 10,000-foot Mt. Haleakala and neighboring islands. From December through April, you can spot the humpback whales frolicking in their winter playground. At the Royal Mauian, you’re within walking distance of shops and restaurants, and only minutes away from world-class golf. The convenient location makes it easy for day trips to all other parts of the island including Lahaina, Hana and upcountry. Contact owner for Cancellation Policy regarding cancellations within 59 days of your arrival date. All that's between you and the ocean is lawn. Enjoy watching the beach and listening to the soothing sound of waves from your living room, master bedroom and lanai. You don't need to cross the street to enjoy the sunsets, watch the beach and ocean action, or look for whales. Large capacity, in the unit. Granite counter tops. Fully-stocked kitchen with everything you might need - from blender to coffee grinder to rice cooker and much more. Cable TV in living room and each bedroom. Small selection of Hawaiian music CDs. Heated oceanfront freshwater pool. Coffee and tea available each morning in the lobby area. Remodeled condo with granite counter tops, tile floors, ceiling fans in each bedroom, the living room, kitchen and lanai, assorted beach toys and accessories, hairdryer, iron. This was the vacation I was hoping for and more! The condo is on the beach with a great view of the ocean through its many well placed windows and lanai. All amenities worked perfectly and made the place feel like home immediately. The place was packed but we never heard the neighbors. Located in Kihei, it is easy to get everywhere on Maui but it's hard to leave Kihei's mild sunny weather. Highly recommended. This was a return trip for us. The condo had everything we needed for a fabulous week in Maui. We spent time at both beaches- no need for shoes! Our meals were on the lanai with the waves in the background. Thank you so much for sharing your home with us! Amazing Place to Stay on Maui! Our family loved this condo! It was well stocked with necessities for cooking and playing. It is close to stores and restaurants. It is also very clean and feels like home. We loved having the washer/dryer too. The roof-top BBQ area was great to have access to. Parking was super easy. The beds were very comfortable. Being so close to the beach while in the condo was amazing. Our favorite part were the sunsets each night, whether we were watching from the condo lanai, the roof-top, the grassy area on the edge of the ocean or the short walk to the beach - just beautiful! Also, the owner Courtney was so helpful, responsive and easy to communicate with! Great location, very cozy condo, lots of amenities, awesome beach view and sunsets! This was our first visit to Hawai’i. We really enjoyed our vacation and will certainly be back. Our accommodation was outstanding- the location was a real central point to the rest of the island- all in all best vacation ever! We would love to stay here again in our next visit! We had an amazing time at this beach front property! The lanai was perfect for watching the turtles, whales, and people. We loved the easy access to Kamaole Beach 1 and 2. The rooftop bbq is perfect to grill up some steaks and watch the sunset. The condo came with a fully equipped kitchen. Lots of beach toys including body boards, snorkel gear, chairs, and sand toys. We truly enjoyed our Christmas stay. Great location for everything you need! This clean and comfortable second story condo overlooked the beach and the nicely landscaped property. We could see and hear the sounds of the ocean while laying in the master bed or relaxing around the unit. When the windows were closed it was very quiet and peaceful, especially with the wonderful darker window coverings they have (although it would get stuffy and warm with the windows closed as there is no air conditioning). The second bedroom did not have a view and was next to the main hall walkway which could get noisy at times, especially with the windows open for air. The nice part about the two bedrooms was that they each had their own full bathrooms and were separated on each side of the unit so it allowed for a lot of privacy. The owner was nice to work with and had a ton of extras on hand like boogie boards, toys, games, small coolers, beach towels and chairs which made beach time perfect! The beach was just a few steps away and we swam with turtles everyday right off of the beach in the surf, as well as snorkeling around the rocks. There were multiple televisions (each room), radio in the living room, excellent internet and some other extra items, so everyone was happy. The owner had plenty of needed basic kitchen items (utensils, dishes, coffee maker (pot), blender, toaster, dishwasher, etc) and also had a few basic staples on hand, which was thoughtful. There was also a stackable washer/dryer unit. We would have to say that the best part of the unit was the nice sized lanai where we could start and end each day watching sunrises and sunsets while enjoying a nice meal or a refreshing cocktail. This was a wonderful location, with so much more than we mentioned and everything else we needed within a short walking distance. The unit was clean and comfortable and we felt safe here. I only gave this 4 stars because we were uncomfortable with the heat due to no a/c and we found the master bed was a little hard for us, limiting our quality of relaxing sleep. We also had a woman calling several early mornings in a row waking us up. Otherwise, this was a wonderful experience and looked just like the pictures.